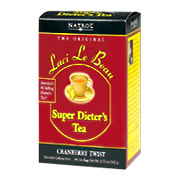 America's #1 selling dieter's tea. Dieting can be difficult. But it can also be satisfying. Especially with the help of my relaxing, flavorful, all natural Super Dieter's Teas. My teas have helped a lot of my friends succeed. They'll help you too. A strong diet and fitness routine can help you take control of your life and change it for the better. Once you do, tell me how my teas have helped you. Share your challenges, and how you overcame them. Pour 12 oz. boiling water over one tea bag and let steep for two minutes. Do not over steep! Press tea bag gently and remove. Drink one 6 oz cup after your evening meal, saving the rest for the following day (may be enjoyed hot or cold). Three or four days later you may increase the strength and flavor of your tea - if you wish - by brewing with 6 oz. of water. It is important not to have more than one cup in a 24 hour period. Do not take for more than 10 days unless directed by a doctor. Not for children under 12. Vitamin C (as Ascorbic Acid): 30mg, Senna (Cassia angustifolia) (leaf): 1.9g, Stevia Extract (Stevia rebaudiana) (leaf): 54mg. Other ingredients: Hibiscus Leaf (Hibiscus rosa sinensis), Spices and Natural Flavors, Orange Peel (Citrus reticulata), Licorice Root (Glycyrrhiza glabra), Marshmallow (Althaea officinalis), Eleutherococcus senticosus, German Chamomile Leaf (Matricaria recutita), Silica, Papaya Leaf (Carica papaya), Japanese Honeysuckle Leaf (Lonicera japonica). 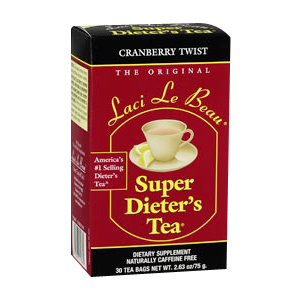 Laci Le Beau Super Dieter's Tea Cranberry Twist is shipped in a discrete, unmarked package. Orders are processed immediately and usually take about 3 to 5 working days to be received. We do ask that you try it for 2 to 3 weeks to feel the full effects. Any information received is used only for order processing and shipping purposes. Your information, such as e-mail address, will never be disclosed to a third party.